Okay, I'll fill out the petition for landmarking Gimbel's but I need some help from you guys. As you know, LPC requires that potential landmarking candidates have to have some sort of historical significance and why it's deserving of that designation. What should I put down? For instance, is there some special about that skybridge like it's the first of it's kind in the city or the only surviving one or the tallest one in the city, etc. Same goes for the building also. Petitions to save historic buildings. Well, may I suggest you folks channel some of that anger into something useful by submitting a petition to Landmarks to landmark the Roosevelt hotel? It's a short, simple form and it'll only take a few minutes of your time. Just print it out, fill out some information and then send it out. Easy as 1, 2, 3. In the "Additional information" section at the bottom, that is where you make your compelling case for why it should be designated a landmark. Many of you have already stated them here, so it's just a matter of repeating it again on the form. Send them an email about the Roosevelt Hotel. Alright now we're talking! The first buildings coming to my mind are, The Roosevelt, the Penn and the Gimbels skybridge. If you can PM the links to me, I will add them to this page. Thank you antinimby for providing the information and link. I sent in a "Request for Evaluation" form and will get other people I know to do so as well. It certainly can't hurt. Great pictures of the building, which appears to be in beautiful condition (unlink the Pennsylvania) are available on the hotel's website. Wouldn't it be a good idea for us lovers of NY buildings to identify buildings that we love, that are not landmarked and are not threatened with demolition? The least we could do is bring such buildings to the attention of the LPC while there's ample time, instead of a last ditch effort which always seems to end unhappily. A wave of evaluation requests backing one particular building may get our voices heard once in a while. Would anybody be interested in such an endeavor? This link contains a picture of the Gimbel's skybridge in case anyone is interested. Also, this is a good site for searching if a particular building is already landmarked. I'm not sure how comprehensive it is, but I never have any luck trying to search the LPC website. Maybe at some point we could attempt to locate less widely known structures. The three mentioned are a good starting point, but I just worry about the sort of "here today, gone tomorrow" buildings such as that beautiful little stable building in the village that was demolished and the numerous townhouses we're seeing disappear. The Hotel Penn certainly has the historical significance aspect going for it, if nothing else. This article from The City Review is loaded with good arguments in its favor. an unforgivable mistake not to protect it. If this is the right building, it looks like a beauty by Delano & Aldrich. Could anybody get a better photo? From a quick look, it's not mentioned in The Architecture of Delano & Aldrich, but that book does mostly focus on their country estates. I'm hoping to make this thread about buildings that already have existing petitions for people to sign. If the thread gets bogged down with inquiries, it may defeat the purpose of people being able to come here and quickly help out buildings. Draft a letter requesting a hearing to landmark the hotel. Five years ago, the 1925 Shore Theater, formerly the Loew’s Coney Island, was nominated for New York City landmark designation by Coney Island USA. On Tuesday, February 9, at 9:35 a.m., the long vacant building owned by Horace Bullard is expected to be put on the Landmarks Preservation Commission’s calendar for a public hearing. This is the first step in the landmark designation process. If you wish to attend Tuesday’s public meeting, don’t be late because the calendaring is expected to take a mere five minutes! The Shore is on the schedule from 9:35-9:40 a.m. Sources say the LPC staff will present a PowerPoint on the building’s history and then there might be a brief discussion among the commissioners. They are likely to vote to calendar the building. The public hearing is typically scheduled one to six months after the calendaring. According to the Commission’s FAQs about the designation process, the public will get to have their say at the public hearing and may submit written statements at that time. Much has been written about the Shore Theater in recent months. Vanishing New York’s photo essay on the theater’s history and probable future and “The Shore Theater: A Sure Part of Coney Island’s Future?” by the Municipal Art Society’s Melissa Baldock are required reading. We hope the building can be renovated and restored so that art and entertainment will again flourish in this once grand movie and vaudeville venue. Although the calendering does not list the building’s interior, we’re told the LPC may consider the interior at a later date. The Shore Theater is also the first of six Coney Island buildings nominated for landmark designation by Coney Island USA. The others are Nathan’s Famous, Coney Island USA Building (former Childs Building), the Grashorn Building (Coney Island’s oldest), the Henderson Building, and the building that housed the B & B Carousell. Coney Island’s four designated City landmarks are the Cyclone Roller Coaster, the Wonder Wheel, the Parachute Jump and the Childs Building on the Boardwalk. The Landmarks Preservation Commission is located on the 9th Floor of the Municipal Building at the corner of Centre Street and Chambers Street, across from City Hall, in Manhattan. More information, including a link to a form to nominate a building for landmark status, is available on the LPC’s website. UPDATE FEB. 9, 5:30 pm…The Municipal Art Society reports that this morning the LPC voted unanimously to calendar the exterior of the Shore Theater, including the rear portion of the building (shown in photo.) Says MAS, “The next step in the landmarking process will be a public hearing, which has not yet been scheduled. We encourage the public to voice their support for the designation of the entire Shore Theater building at this hearing or through sending letters and emails. 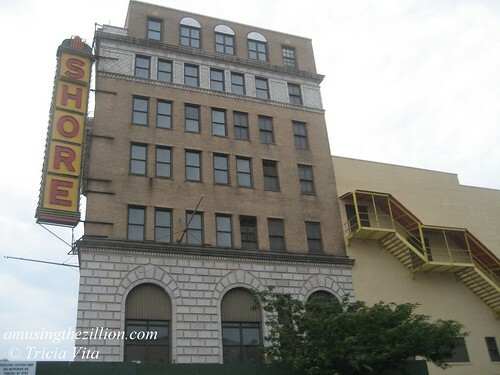 The final designation steps will be the Commission’s vote, followed by a City Council vote.” Courier Life’s Joe Maniscalco reports that the public hearing date for the Shore theater designation has been set for March 23 and the calendaring of the Coney Island USA Building on February 16.